Oh yes, you read that right. Burger. Of. The. Week. Last week Collin got home a bit early from work and as I was running out the door to pick up the kids I yelled back at him - can you make some burgers from that ground beef and put them on the grill? Oh, and make sure to add some worcestershire sauce!! Did you know worcestershire sauce is the secret to making the Best. Burger. Ever.? It is. You should also add some garlic salt and chopped onions. I only had to take one bite of that juicy burger seared to perfection on the grill to know this was going to become a regular menu item this summer. Although we're nearly a week into this new summer schedule I've been so behind in life up to this point that I haven't yet had a chance to really stop and catch my breath. What I'm saying it, we're low on groceries. So this week's burger wasn't anything really fancy, but it was delicious. 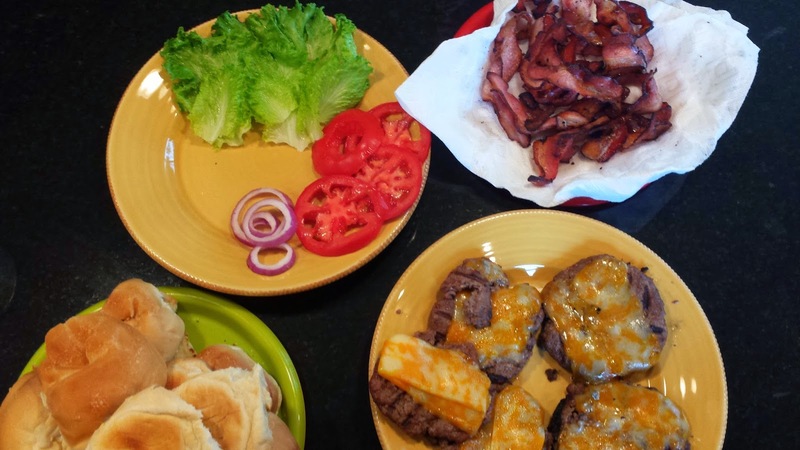 The goodness of the traditional Bacon Cheeseburger is amplified by a slightly toasted bun and toppings such as lettuce, tomato, red onion, mayonnaise, and ketchup. I should also note that these are no sissy burgers they are Monster Burgers. Monster Burgers are a little more challenging to eat, they require a certain technique: two hands and a slight bend in the upper body. Make sure your face is fully over your plate because there will be drippage. But don't despair, drippage only means you're doing it right. If you have any questions feel free to inquire with my 5 year old. Keaton knows how to do this - go ahead and ask, he'll tell you - he saw it done on Duck Dynasty. Yeah, that's the same picture again, I couldn't resist. Who want's a Bacon Cheeseburger? Great idea!! 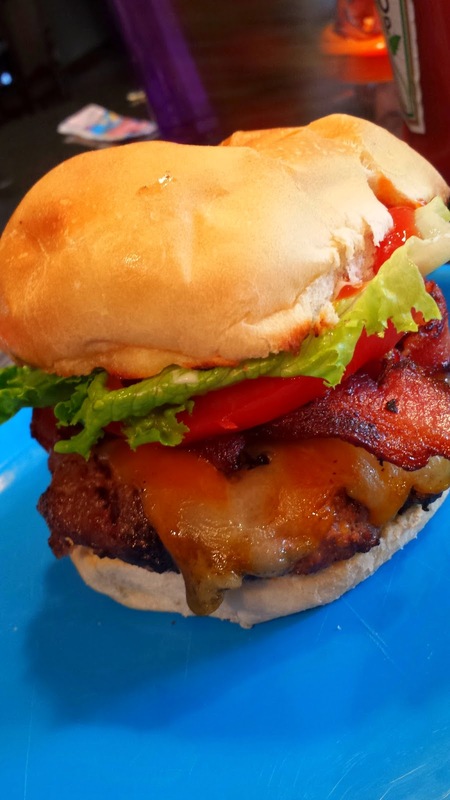 We have been grilling the last pork chops from 'Pscuitto lately, and some weekly burger is a great change!